I know almost every time I write one of these Untappd Catchup reviews I say this will be the last. Lets stop kidding ourselves; in all likelihood there will be more! The World Cup is taking a fair bit of my drinking/writing time at the moment and so these are the badges I earned over the last week or two. Drink Like a Kiwi (Level 8) is a beer I've discussed in one of my recent reviews; Garage Project's Pernicious Weed. It's such a good American IPA! Very bitter tropical fruit and citrus flavours and aromas come from the hops. It's just a beautiful example of the style. Another beer from my Bear Club pack that earned a badge was St Bernardus ABT 12. The badge was Belgian Holiday (Level 10). I'm surprised it's taken me over 1000 unique beers to hit 50 beers from Belgium. Anyway this is a great Quad, one I would recommend to anyone, but especially to lovers of Belgian beers. The World Pint badge arrived by surprise when I was having a casual pre-footy meal at the Baden Powell on the Queen's Birthday public holiday. The beer was a personal favourite; Stone & Wood Pacific Ale. I have reviewed this before, way way way back when I was starting my blog - you can find that review here. Be warned it's an awful review! I think as one of Australia's premier beers it needs a re-do at some point soon... Watch this space. Last night I went badge whoring, I not afraid to admit that. Fat Tire was the beer and it earned not 1 but 2 badges. The Fat Tire Experience is a badge for simply cracking into a New Belgium Fat Tire before September 30th, one of America's premier Amber Ale (although it's not particularly amber...). You can find a previous review of mine here. Badge 2 was I (heart) Colorado, to get this one you need to drink 2 beers from the following list of breweries before June 29th. The best beer was yet another beer I've had before, Geuze Boon. Pucker Up (Level 9) was the badge, again I'm surprised that it's over 1000 beers for 45 sours but there you go... Oude Geuze Boon was the beer you can find a photo above and read about my previous experience of it here. 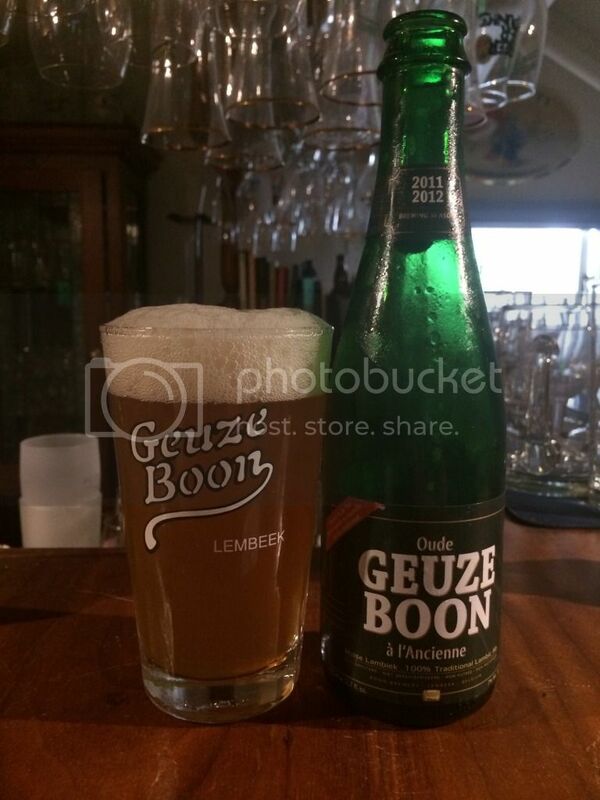 I'm aware this will be a contentious opinion, but for me Geuze Boon is one of the best beers to have with dinner. The dryness really seems to add something, which I've never quite been able to place. Another 6 badges have been given the short review on Beer O'Clock Australia. I'm really hoping that soon I'll be able to get back doing the full reviews that I love. I'm still on the hunt for the remaining few countries in the European Beer Challenge. As usual if you can help with any of the remainder please email me, gus.norris7@gmail.com , or if you have any suggestions/questions please drop me a line.